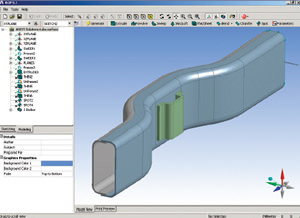 A dbb file extension is related to the DesignModeler developed by ANSYS. A dbb file stores database backup. The dbb file extension is associated with DesignModeler and other applications developed by ANSYS and used for geometry handling, meshing and post-processing. The dbb file contains backup of database used by ANSYS applications. Use ANSYS DesignModeler to work with *.dbb files. Programs supporting the exension dbb on the main platforms Windows, Mac, Linux or mobile. Click on the link to get more information about ANSYS DesignModeler for recover dbb file action. Programs supporting the exension dbb on the main platforms Windows, Mac, Linux or mobile. Click on the link to get more information about ANSYS DesignModeler for backup dbb file action.